Mountaire Executives tour the Oak Orchard/Riverdale Boys & Girls Club on Thursday, Jan. 10, and presented their $20,000 donation to the Oak Orchard/Riverdale Boys & Girls Club. Pictured, from left, are: front row, Cathy Bassett, Mountaire director of Communications & Community Relations; Phillip Plylar, Mountaire president; Mike Little, Mountaire vice president of sales; Ashley Reynolds, Greater Milford Boys & Girls Club Board member and Great Futures Gala co-chair; Erica Kennedy, unit director for the Oak Orchard/Riverdale Boys & Girls Club; Linda Cullen, Oak Orchard/Riverdale Boys & Girls Club Board member; C.J. Pitts, Oak Orchard/Riverdale Boys & Girls Club program coordinator; Millie Charnick, vice president of operations for the Boys & Girls Club of Delaware; Mary Jo Tolliver, Great Futures Gala Committee member; Jullie Burton, Oak Orchard/Riverdale Boys & Girls Club Board member and Great Futures Gala co-chair; Toby Cullen, Oak Orchard/Riverdale Boys & Girls Club Board president; back row, Tracey Gross, Great Futures Gala Committee member; Chicki Kennedy, Oak Orchard/Riverdale Boys & Girls Club Board member, Tammy Ward, Oak Orchard/Riverdale Boys & Girls Club Board member, Nicole Silicato-Miller, Greater Milford Boys & Girls Club Board vice-chair; and Rose Vendetti, Great Futures Gala Committee member. 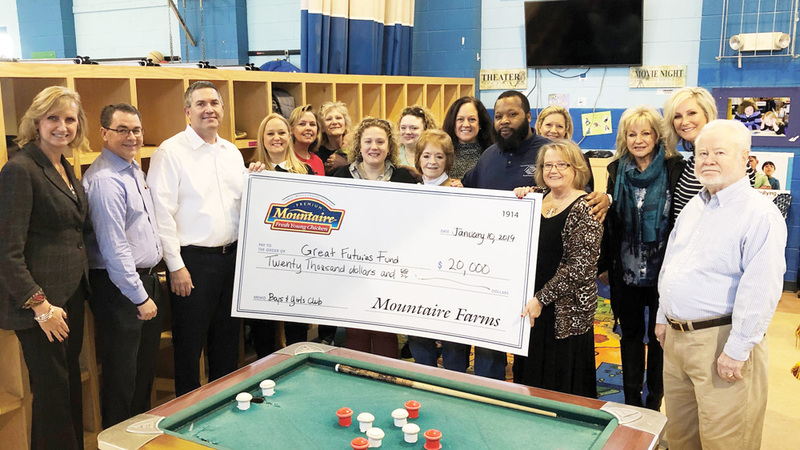 Mountaire Farms recently provided a $20,000 donation to help launch a fundraising campaign to expand the Oak Orchard/Riverdale Boys & Girls Club. The club currently serves 100 children from the local area and has a waiting list of those who want to participate but are turned away. “It’s heartbreaking to hear stories about kids who could benefit from these before- and after-school programs but can’t join their peers because of space limitations,” said Mountaire Farms President Phillip Plylar, who had recently toured the facility. A fundraising event — the Great Futures Gala — to help kick off the capital campaign for the expansion is being held on Feb. 7 at The Peninsula Golf & Country Club. For tickets or sponsorship information, visit www.GreatFuturesGalaDE.com or call (302) 945-3350.